The short answer is easy: Gabrielle Giffords was shot by Jared Lee Loughner, a resident of Tucson, Arizona. The forensic investigation will rightly be focused on him and on determining whether anyone else was directly involved in planning the attack. That is as far as causal analysis can go, and the law should go no farther. But that is not the end of the story, and any political assassination attempt raises the question of whether there might have other, perhaps unwitting accomplices. Sarah Palin, for example. 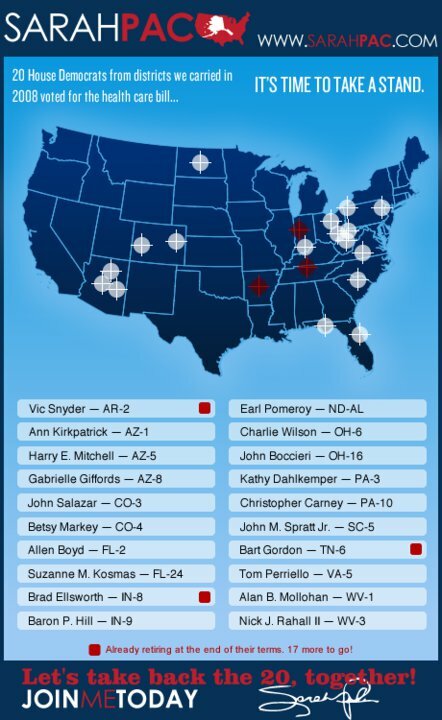 Palin’s lock and load rhetoric and use of this map at her website to target Giffords was a source of concern well before the attack and an obvious example subsequently of the how political rhetoric might be encouraging actual violence. Of course, it took no more than a day for the right to denounce any such interpretation as left-wing politicizing of the tragedy. The hypocrisy is stunning, and it is disgraceful to pretend that politics had nothing to go with the shooting. Unfortunately, the carnage in Tucson is a political tragedy and needs to be confronted directly on those terms. Hundreds of commentators and thousands of other citizens are discussing the relationship between violent words and violent acts, and what level of civility is possible in a political culture that thrives on a volatile combination of free speech and intense competition. This discussion is necessarily political and inevitably politicized. I’m still too distraught by the shooting to say much, but a few things about the debate as it already is developing need to be noted. First, the false equivalencies created by our professional journalists are a disservice to the republic. Over the course of history, extremism may be distributed equally across the political spectrum, but in the US–right now, right here–the violence is coming largely from the right. The threats and actual acts of violence time and again are attacks against “targets” selected because of their progressive beliefs. Although I am truly grateful that elected officials, like most of those they represent, are now standing together in sincere condemnations of violence, one side-effect of that show of unity is to whitewash the actual problem. As the press does the same, it helps to perpetuate the problem. Right wing domestic terrorism needs to be identified for what it is, and those who provide it comfort or cover need to reconsider what they are doing. What are otherwise acceptable habits of partisan advocacy and balanced reporting can collude inadvertently to normalize violence and put democracy itself at unnecessary risk. Likewise, in rightly worrying about the incendiary effects of political rhetoric, it is easy to spread the blame too widely. We may all be partisan, and electoral campaigns push everyone toward hyperbole, but not all political slogans are equally inflammatory. In the health care debate, there is a difference between saying “rising deficit” and “death panels”: wouldn’t you consider violence to protect yourself against a government bent on killing? In promoting political change, there is a difference between “change now” and calling for a “Second Amendment solution”: only the latter specifies the use of firearms. The left had its flirtation with violence in the sixties, and it lead to actual killing in Madison, Wisconsin–an accidental death that brought many on the left to pull back from the edge. Today, the right side of the political spectrum is awash with fantasies of violence–look at the web sites–and political candidates have been running ads that glamorize bearing arms and even insurrection, while right wing celebrities have been warning of government takeovers, vilifying their political opponents as traitors, and generally selling visions of an Armageddon where all personal accountability can be thrown away while defending the righteous cause. One reason such extremism can persist is that much of the time it seems harmless. Human beings are not slaves to political rhetoric, and society is much too complex for any one message to directly cause much of anything. In fact, ordinary people can hold crazy beliefs because they don’t really have to live them: Don’t believe in evolution? Fine, as long as you still see your doctor and take your medicine. Think that Obama is plotting to place America under Sharia law? Fine, as long as you still stop at red lights. Get a kick out of Sarah’s map? No problem, as long as you don’t go around killing people. But, of course, not everyone is wired the same way. Even so, in a different political climate Jared Loughner might have simply killed himself–a terrible thing, but not an assault on all of us. Indeed, I can’t help but think that in a society with a better health care system he might have gotten the help he needed before more deadly alternatives became possible. He is but the symptom, however, and his mental illness is not the malady that most needs to be treated. No one but Jared Loughner pulled the trigger, but his paranoia and rage will have been stoked by those who have demonized American government and endangered public officials with cheap rhetorical ploys that carry insinuations of violence. Let me close by suggesting that the cross hairs in Sarah’s map might not be the only problem. The map itself, like the political rhetoric it was channeling, absolutely depends on maintaining a certain sense of ideological abstraction. Politics is to have only one face–that of the charismatic leader–while everything else has to be seen in terms of stock ideas (“big government”), broad generalizations (“the liberal media”), mythical places (“the real America”), ritual symbols (the Constitution), and messianic outcomes. That kind of thinking turns everything into simple formulas–which invite simple solutions. It also is profoundly anti-democratic, in this sense: democratic politics is supposed to be about ordinary people governing themselves, which they can do by recognizing each other as individuals, treating one another with the respect due to political equals, paying attention to each others’ actual experiences, acknowledging the value of compromise, and working together for a more perfect (though still fallible) union. 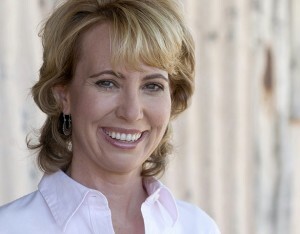 Those were the ideals that animated Gabrielle Giffords. And that is why, if we are to appreciate the true violence in what has happened, we need to see not a map, but her picture. The photograph is from Reuters. The map that was at Sarah Palin’s web site has been removed; on Palin’s response to the tragedy, you might read Tina Dupuy. 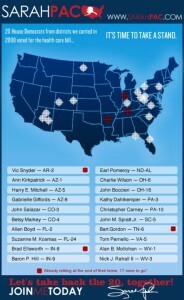 If you want to sign a MoveOn.org petition against overt and implied appeals to violence, click here. ← Previous PostOur Holiday Gift to You: Malware! Rather than frame violence as a product or agenda of the political right, I consider violence a constant undercurrent of the republic. One of our national traits, a dark undercurrent that we prefer to ignore when we can. When the effects of ultra violent acts erupt in different contexts and with higher profile victims, these acts emerge as national tragedies, with flags flown at half mast. The truth is that gun violence disrupts communities and destroys lives daily in the United States. Routine violence is normal here, but some victims–and some perpetrators–are more attention-worthy than others. Obviously, a congressional representative, her heroic intern, an innocent child, and a “crazed” gunman of a certain socioeconomic group will provoke great outrage and a mediated frenzy. Routine violence shocks us when it shows up outside of where we have accepted it as routine. The social–not the political–context of Loughner’s attack on innocents distinguish his acts from the daily acts of mayhem we teach ourselves to ignore. There is no need for the right to indulge in “fantasies of violence”–the violence in this republic is real, and might even serve their agenda. Brenda: Thanks for your important comment. I wanted to say as much, but decided I could only say so much in any one post. Violence is indeed as American as cherry pie. At the same time that the political class is decrying violence, TV and films are awash in it, and US foreign policy is defined by weapons sales and warfare. In my more immediate experience, the Chicago papers continually report the killings, usually of children and young adults, from gang-related gunfire. Those deaths should count just as much as any other, and yet too often violence is excused because it is defined as not political. That said, broad brush condemnations can provide cover for those who are willing to channel the dark side of American culture. They also can minimize the role that democratic government should and does play in reducing violence. The attack on an elected representative is an attack on democracy and the rule of law. Today such attacks come largely from the right, and they are aided by those–and not a few–conservative politicians and media figures who have been actively indulging a desire for violence. American society needs to be improved from top to bottom, but the most immediate change that is needed is for those who have privileged positions in public discourse to step back from the worst forms of demagoguery. Then we need to ask the hard questions, such as why violence and images of violence are so prevelent in an otherwise quite civil society, and why so many Americans are so susceptible to its appeal. Human beings are not slaves to political rhetoric, and society is much too complex for any one message to directly cause much of anything. – The government should listen what society/people want, not what the governments wants. I keep asking the question (everywhere I go): Can the National Rifle Association possible be the ‘well regulated militia’ our Founding Fathers envisioned in drafting the 2nd Amendment?